This is 3 of 8 part of struts 2 tutorial.It provides struts 2 hello world example. lets start with first struts2 application. We will implement modules described in above diagram in our project. 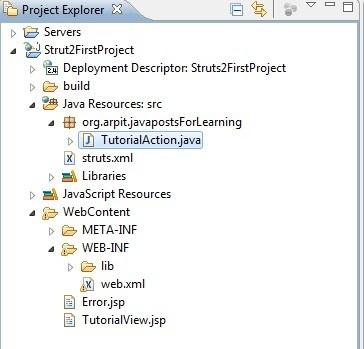 Create dynamic web project named “Struts2FirstProject”.For configuring struts 2 in your eclipse ide please refer configuring struts 2 link. 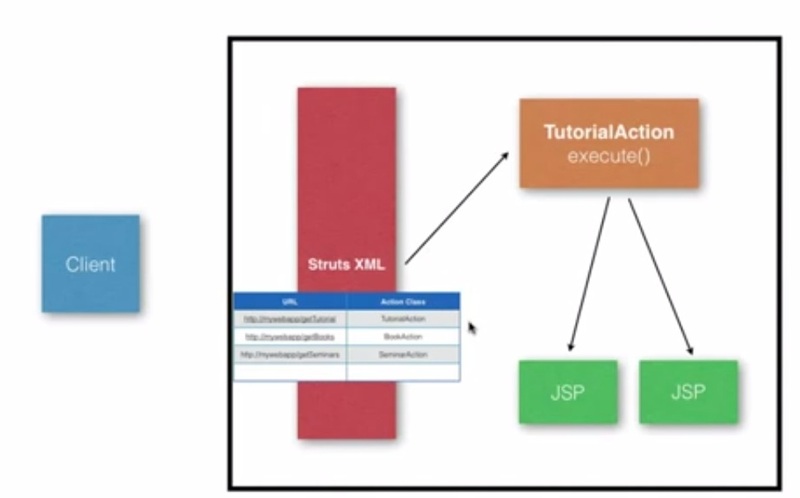 The web.xml configuration file is a J2EE configuration file that determines how elements of the HTTP request are processed by the servlet container. 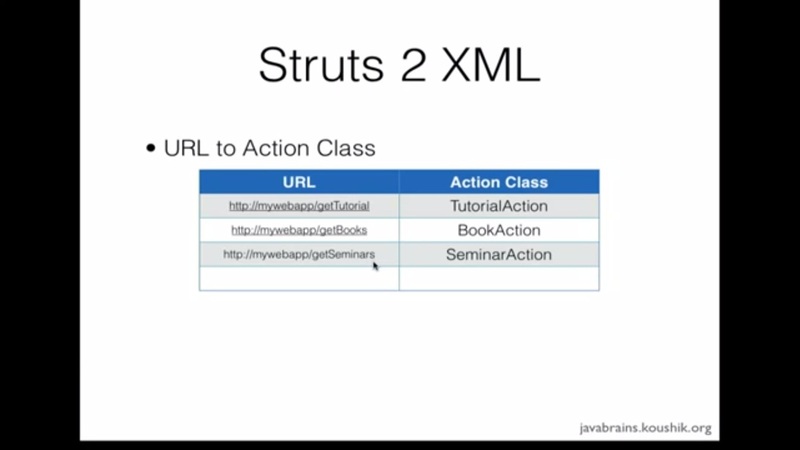 It is not strictly a Struts2 configuration file, but it is a file that needs to be configured for Struts2 to work. As discussed earlier, this file provides an entry point for any web application. 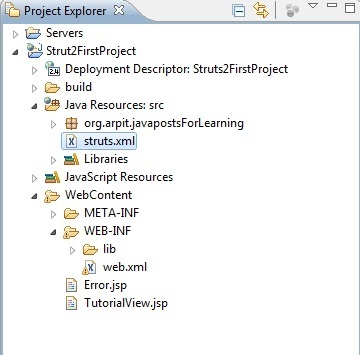 The entry point of Struts2 application will be a filter defined in deployment descriptor (web.xml). 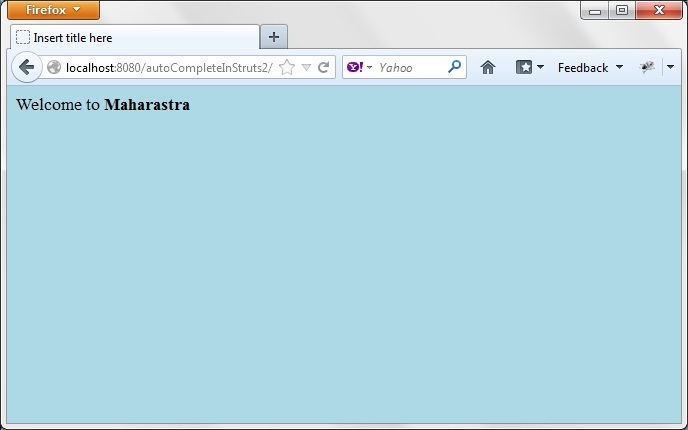 Hence we will define an entry of FilterDispatcher class in web.xml. 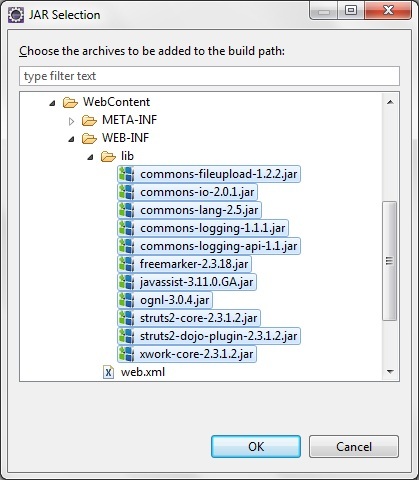 The web.xml file needs to be created under the folder WebContent/WEB-INF. We will have action class which is simple POJO class having attributes and method. By default execute() method is called when client request goes to action class. 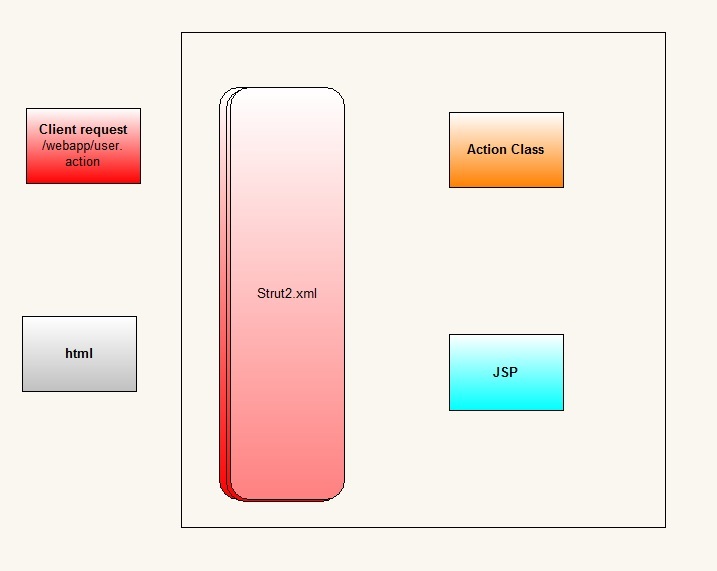 Create TutorialAction.java under src.Here we have TutorialAction.java as action class in our project. 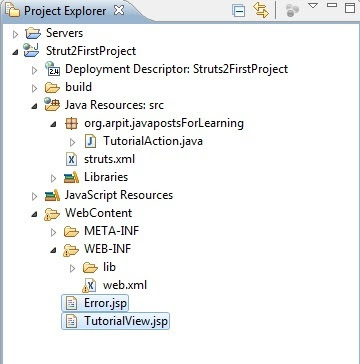 Create two jsp files named “TutorialView.jsp” and “Error.jsp” under WebContent. 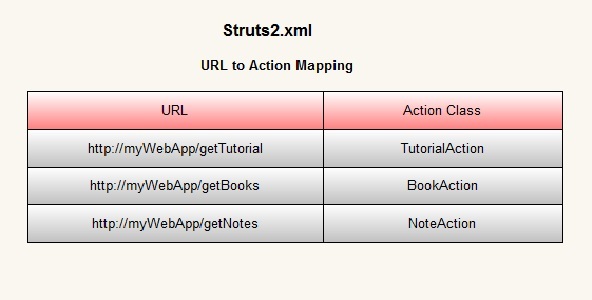 strut2.xml provides mapping between url to action mapping. 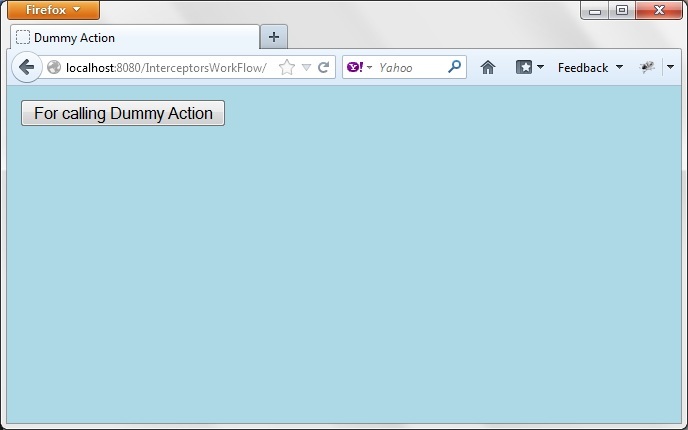 So if client enters “http://mywebapp/getTutorial” then Tutorial action will be called. 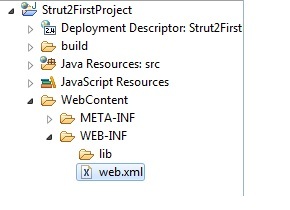 Create strut2.xml under src folder. 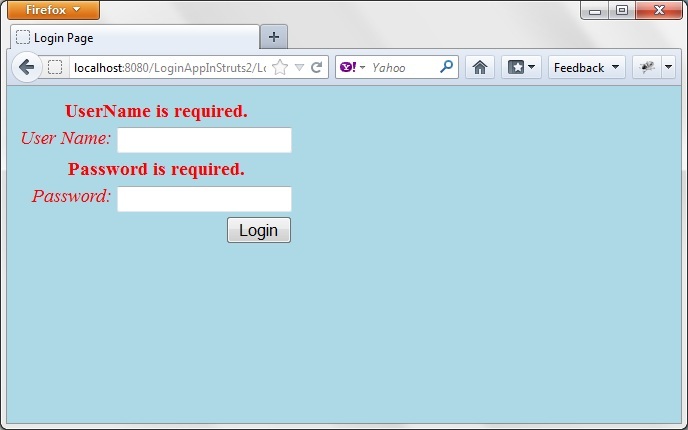 Request(http://localhost:8080/Strut2FirstProject/getTutorial) is generated by client and sent to Servlet container. Servlet container invokes FilterDispatcher filter which in turn determines appropriate action.In this project,getTutorial action goes to TutorialAction class. As per mapping in struts2.xml, name is matched with returned string “success”. Accordingly,TutorialView.jsp is rendered and returned to user. Now finally we will run our project. 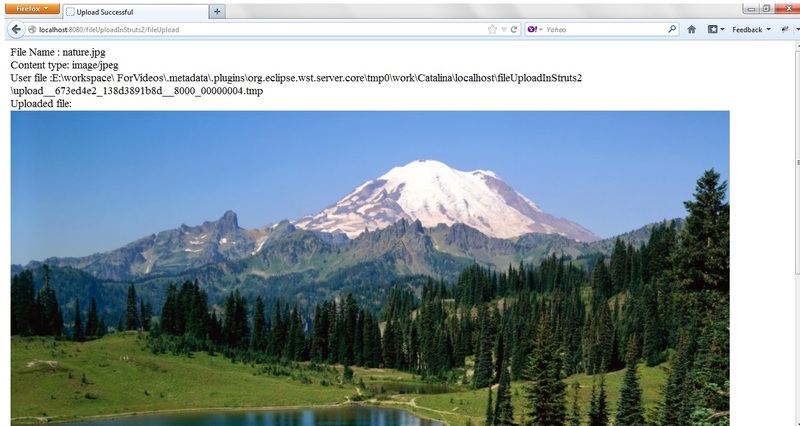 so when you paste resultant url to your browser,you will get some thing like this. We are getting this error because we have declared welcome file as “default.jsp” which do not exist. 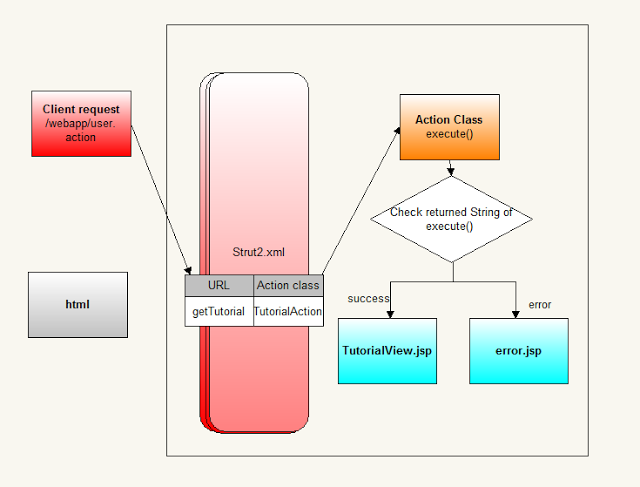 as we included action(getTutorial) in url,It rendered “tutorialView.jsp” as output.